There’s a Uniden cellular signal booster for all your customers’ needs! Few things are more frustrating than a weak cellular signal causing missed and dropped calls, hanging web pages, frozen video streams and blocked online games. There's a Uniden Solution for all your customers needs, whether it's inside a building for their home, office, cottage, workshop or while they are on the go in their car, truck, boat or plane. 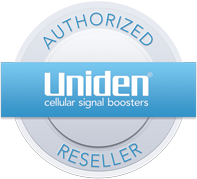 Uniden Cellular Signal Boosters use the latest in cellular booster technology to solve the problems of poor reception, dropped calls, and slow data that users experience on every cellular network. A brand name your customers know and trust.